If you have rheumatoid arthritis, it seems natural to blame all of your pain on the disease. After all, it is a chronic disease and symmetric joint pain is the primary symptom. Back pain is more commonly associated with osteoarthritis, but rheumatoid arthritis can affect the spine. 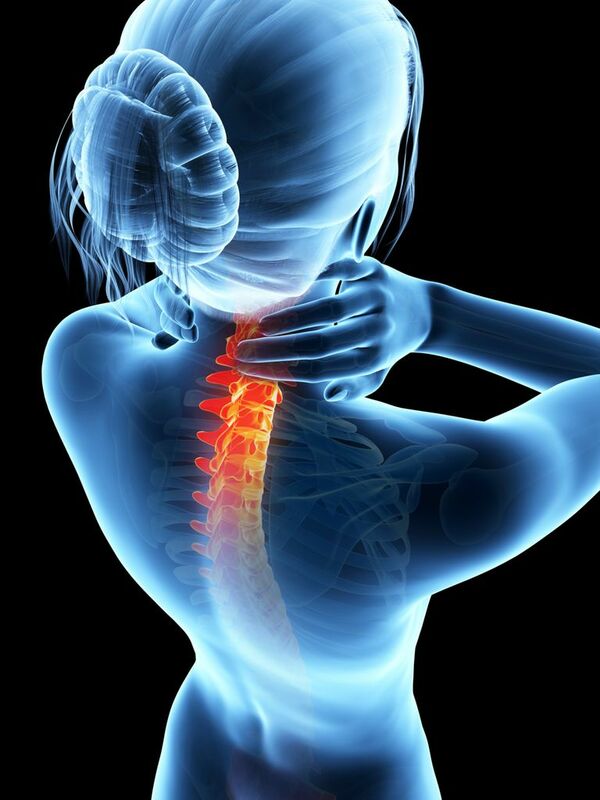 Rheumatoid arthritis that affects the spine can cause neck pain, back pain, and there can be radiculopathy (pain that radiates to the legs or arms) due to compression of the nerves within the spinal cord or the nerve roots. When rheumatoid arthritis is the source of back pain, it is more common for the cervical spine (neck region) to be affected rather than the thoracolumbar spine or sacroiliac joints. Cervical spine involvement with rheumatoid arthritis usually occurs with advanced disease. It is the upper cervical spine that is typically involved in rheumatoid arthritis. Laxity of the ligaments that support the first and second cervical vertebrae (C1 and C2) can lead to instability at that level of the spine. Patients with rheumatoid arthritis should be routinely evaluated for symptoms of subluxation (partial dislocation) in the cervical spine. If subluxation causes compression of the spinal cord, there may be signs of long tract involvement (the upper motor neurons), including hyperreflexia (over-responsive reflexes). Extension of the inflammatory process from adjacent neurocentral joints into the discovertebral area (the interface between the disc and vertebral body). Chronic cervical instability initiated by apophyseal (facet) joint destruction, leading to vertebral malalignment or subluxation, which may cause microfractures of the vertebral endplates, disc herniation, or degeneration of disc cartilage. Involvement of the facet joints of the lumbar spine and discitis have been attributed to rheumatoid arthritis on occasion, mostly following imaging and post-mortem studies. In clinical practice, before rheumatoid involvement of the lumbar spine can be diagnosed, common and serious causes of back pain (e.g., vertebral compression fractures) must be ruled out. A problem with bowel or bladder control (e.g., incontinence, inability to urinate, or inability to control the bowels) may be a sign of spinal cord involvement. This requires immediate medical attention. If rheumatoid arthritis causes destruction of the facet joints in the spine, a condition known as spondylolisthesis may develop. With spondylolisthesis, an upper vertebra slides forward onto the top of the next adjacent lower vertebra. The slipped vertebra can put extra pressure on the spinal cord or the nerve roots where they exit the spine and cause some of the aforementioned problems associated with pressure on the spinal cord. Arthritis and Diseases That Affect the Back. The Arthritis Foundation. Currier BL, Coblyn J. Cervical Subluxation in Rheumatoid Arthritis. UpToDate. Venables PJW, Maini RN.​ Clinical Manifestations of Rheumatoid Arthritis. UpToDate.